Ek Biç Ye İç, which translates to Plant, Harvest, Eat, Drink is a new indoor garden and cafe located in Taksim's Gümüşsuyu neighborhood, which serves up the freshest of products in delicious soups, salads and wraps and is run by a collective of sustainability-minded artists in their own right. With their impressive indoor garden where by using hydroponics they grow much of the fresh greens and some produce offered on their menu, there couldn't be a better match than their upcoming union with Sefatoryum, a stunning transformation of the Istanbul Modern foyer into a tranquil and living respite of nature in the city as part of the ongoing Till It's Gone exhibition. 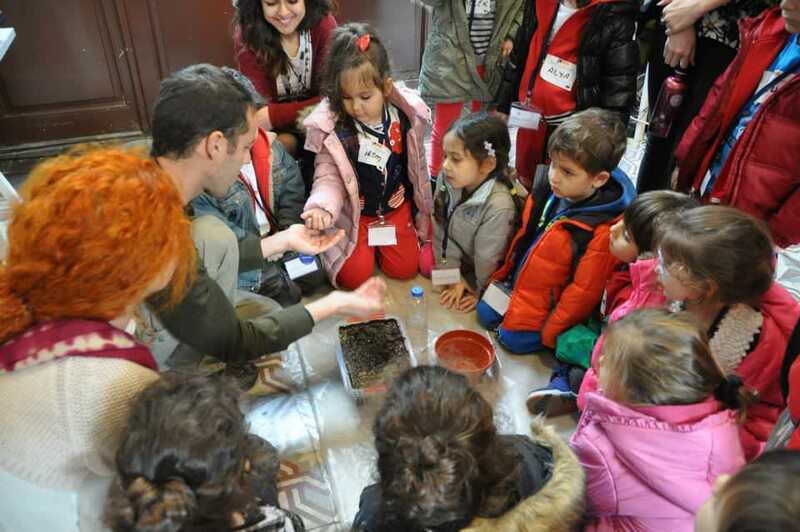 On Thursday, April 7 from 5-7 p.m., the Ek Biç Ye İç team will be explaining what they do and introducing their permaculture-style practices at the Sefatoryum exhibit and on Saturday, April 9 from 2 p.m. to 4 p.m., Camila Rocha the creator of Sefatoryum will be giving a talk in English on her artistic practices and the meaning behind her inspirational large-scale installation project at Ek Biç Ye İç. 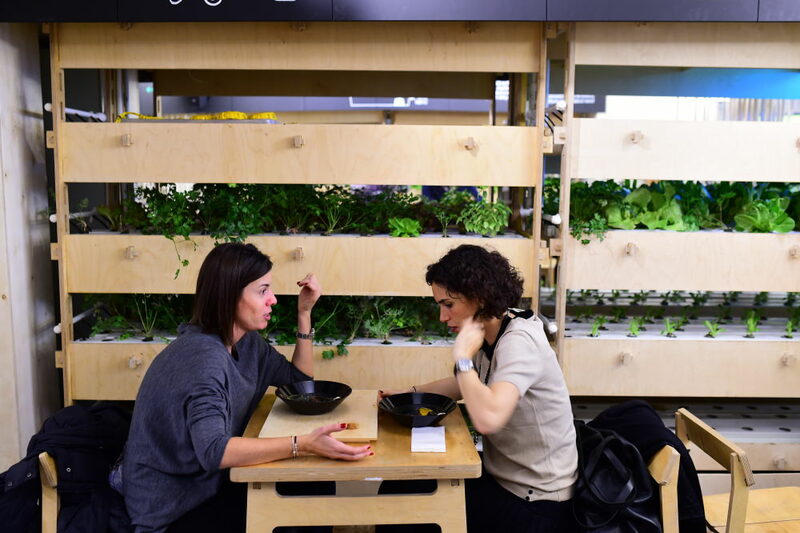 If you haven't yet visited either, this double-event on permaculture and sustainability is the perfect opportunity to discover ways to incorporate nature into the urban lifestyle while doing so in some of the most beautiful indoor gardens in the city. I had the opportunity to speak with both Ayça İnce Program Director For Ek Biç Ye İç as well as Brazilian expat and artist Camila Rocha on the upcoming event and exciting opportunity for an exchange of ideas. 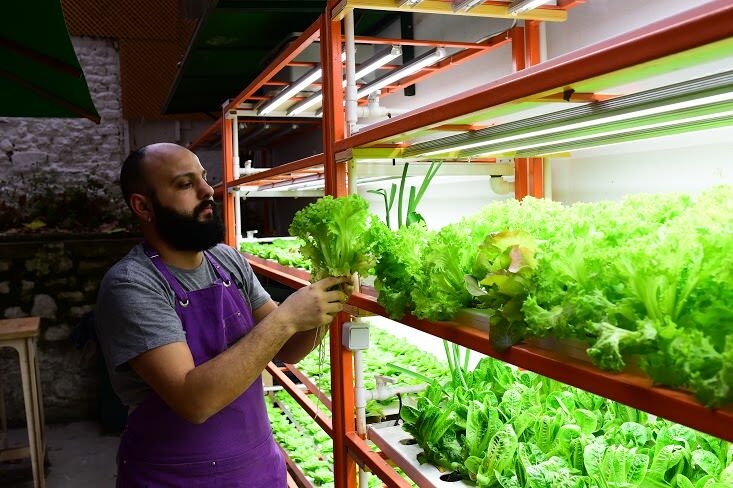 Opened as a restaurant in August 2015 as a social initiative, Ek Biç Ye İç aims to show ways to grow produce in the city and to keep the carbon footprint to a minimum. "A team project spanning from chefs to social scientists," Ayça tells me adding that in the Ek Biç Ye İç library, they also have "a wide selection of books on food, ecology and DIY culture." In addition to offering a delicious fresh menu of mostly organic but all specially sourced products from 10 a.m. to 6 p.m. every day except Sunday, Ek Biç Ye İç is also a space where talks such as this Saturday's with Sefatoryum creator Camila Rocha are held as well as workshops such as their 'Prepping for Spring' with permaculture specialist Shaul Shaham, which will take place in the morning on Saturday, April 9. 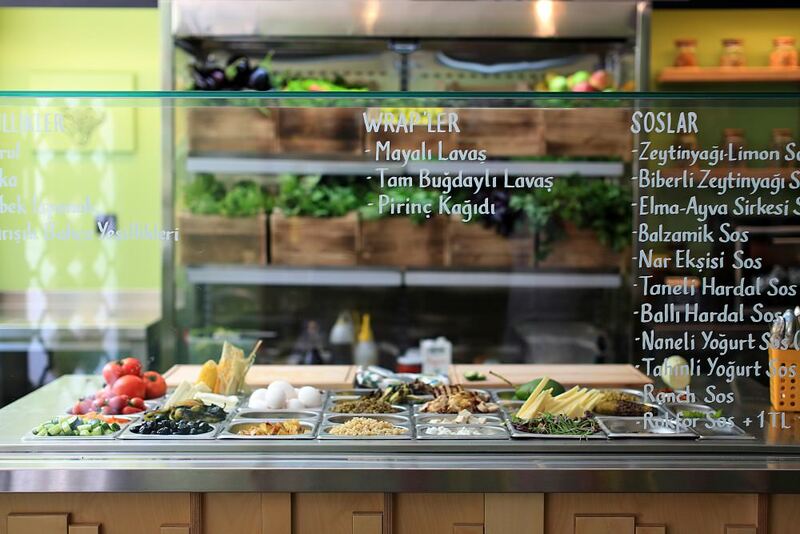 The next Saturday, April 16, cookbook writer Elvan Uysal Bottoni will be giving a workshop on 'Motherhood and Cuisine' and on Saturday, April 23, Ek Biç Ye İç will be hosting the Pickle Making 101 course. Catching up with Brazilian artist Camila Rocha, the creator of the Sefatoryum exhibit set up as a living garden with places to sit and rest in the foyer of Istanbul Modern, she tells me that at first it took her some time to understand the space of the Museum when curators Celenk Bafra and Paolo Colombo proposed she make a site-specific large-scale installation for the Till It's Gone exhibition. "I understood that area as being a central point, the square or piazza, basically the hanging out spot of that institution," said Camila. Her first move was to paint the columns brown, turning them into tree trunks appearing to sustain the building. Her next step was to elevate different domesticated plants on plant stands, which she describes as "a piece of furniture made to give a plant it's important position inside a home, almost like a worshiping of sorts, unfortunately slowly becoming an obsolete object." Finally, she elevated people with the çay stools, she explained adding. "Looking at them like the chloroplasts of a plant cell, that is constantly moving by the audience. On the other side you have suspended species of plants, in mobile structure, moving with the air that naturally passes through it," she said. I told her how stunning I found it as a place to catch your breath in the heart of the city and asked where the plants she created this leafy haven came from. "The plants are from Turkey, but I choose especially 'domesticated' plants that could be found anywhere around the world so people would relate to it closely." "The title came from an Italian book about gardens, Giardino Mania, and inside there was this picture of a woman in a swing, with the chapter entitled 'A Place for Pleasure.' So, I added a swing in the space, to give the pleasure of being, which we so need these days, and to suspend people as I am suspending these species of plants," Camila said. "I want to create a space of escape (like in my previous projects) from the harsh daily life, a space to feel the pleasure of being, therefore the title is the self-made world 'Sefatoryum.' Sefa being the word for pleasure, enjoyment and life and 'toryum' the Turkish spelling of the 'torium' suffix meaning 'place for'." 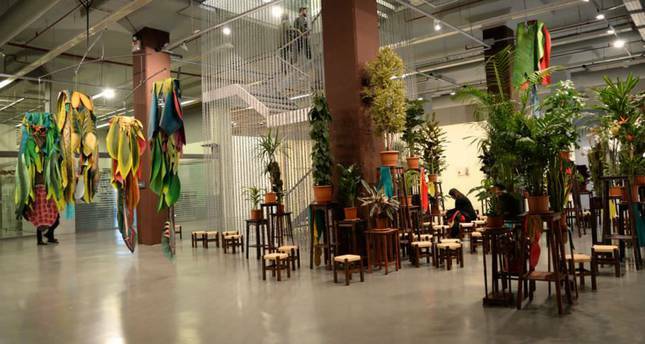 What she describes as "a living organism, a plant cell" is in effect a tranquil indoor garden for leisure, meetings or other social activities centered on nature, seeds, ecology and the environment such as the upcoming talk by Ek Biç Ye İç. "To make it challenging, we decided to have the displacement, in which Ek Biç Ye İç will come to the museum to talk about their practices on April 7 and I will go to Ek Biç Ye İç on April 9 to talk of mine," she tells me. Fellow expat and visual artist, Camila Rocha studied fine arts in Sao Paolo and moved to Istanbul from Rio in 2004 after a number of artist residencies in Helsinki and Stockholm. I asked her what her life is like as an expat in Istanbul and she told me that she has been working as a contemporary artist, has done exhibitions and projects both here and abroad such as her upcoming exhibition opening in late May and curated by Ali Akay at a newly opening gallery called Krank and in August a project at Capacete in Rio de Janeiro. Camila also runs the Artist Estate of her late husband, Hüseyin Bahri Alptekin. April 9 just send an e-mail to info@ekbicyeic.com by April 7 to let them know you're coming.